(Newser) – The US should comply with international law and fully investigate reports of civilians killed and wounded by CIA drone strikes in Pakistan, Amnesty International says in a report released today. It provided new details about the alleged victims of such attacks, including a 68-year-old grandmother hit while farming with her grandchildren. In another incident noted by the report—titled "'Will I Be Next?' US Drone Strikes in Pakistan"—witnesses said 18 male laborers with no links to militant groups died when a volley of missiles hit a tent where a group of men had gathered for an evening meal after work, followed by a second round of missiles that killed rescuers. 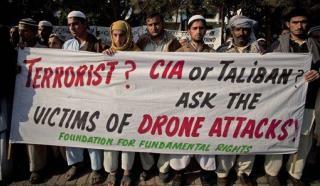 Drones are a valuable tool in the arsenal for seeking out and destroying those who seek to destroy us. One thing the article does not discuss is how these individuals often keep "innocents" -- typically their families with them. Yes, innocents do get killed; however, have you ever noticed how Muslim "infighting" has no respect for others -- Every day, some "bomber' goes on a bus, or goes into a cafe, or heads into a marketplace, or even targets a school, etc. and simply blows himself and everybody around up. Do you ever hear regrets from the people behind the bombings? Whether fighting on the ground, or fighting from the air, innocents will be killed in our world. American policy has always been to protect innocents as far as possible. This is why so many of our own troops are often injured or killed taking action to protect innocents in a battle situation. When have Muslims ever done so? The brutality of war is a reality. Those of us who live in the U.S. and Canada have been fortunate to be shielded from most of the brutality. When your family, and friends, face the absurdity of Muslim fighting Muslim and see the lack of respect Muslim's have for life, then you can complain about how we are carefully using drones; rather than sending soldiers into such areas to do the job. The thousands of civilians killed on 9/11/2001 should be a war crime too, but you don't see Amnesty doing anything about that.